Milkweeds are champions at attracting a wide variety of insect species. There are the casual visitors that come to the plant just for food, as well as an entire menagerie of species that are intimately tied to milkweeds for their survival. When out walking, I always check the milkweeds to see what animal life can be found. A variety of tiny flies were visiting this bloom. Common Milkweed, Asclepias syriaca, is a plant of the open fields. Many people tell me that milkweeds growing in the field are a sign of mismanagement. It seems to confuse them when I suggest that the presence of milkweeds only signifies poor management if you are managing for a condition that doesn’t include milkweeds. Milkweeds in a pasture or hay field indicate poor management, but milkweeds in a field being managed for diverse native grassland species do not, so don’t use that as an argument that I’m not caring for my fields. This is the point at which I turn the conversation towards the weather, which my daughter says is the only subject I’m capable of handling in social situations. The fully opened milkweed blossom is a nectar factory that feeds a multitude of different species. I’m especially interested in pollinators and spend a lot of time watching the native bees. A few weeks ago I was with some backyard fruit growers who were lamenting the decline of the European Honeybee and wondering how their flowers would be pollinated if things didn’t improve. When I suggested they try managing for native bees that could provide the same pollination service, they looked at me as if my hair had caught fire. Apparently, any acceptable substitute had to share the honeybee’s ability to work on demand as well as produce a marketable byproduct. This grasshopper is eating a portion of the flower. Milkweeds contain steroid glycosides and other toxic substances that make the plant unpalatable to all but a few species that have evolved to deal with the toxins. 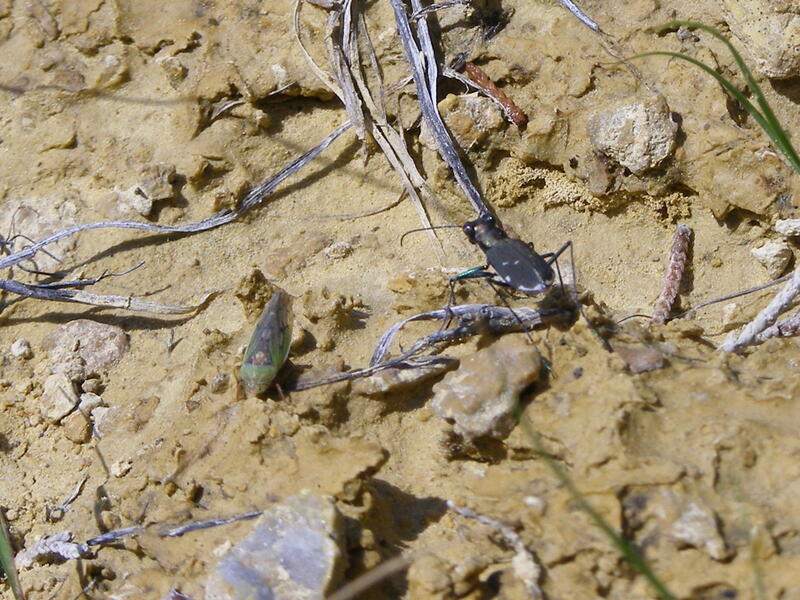 The concentrations of toxins vary throughout the plant, so the grasshopper may be feeding in a less dangerous area. The tiny white spot on the grasshopper’s back is the empty skin of a tachinid fly egg. The larva has recently hatched and made its way inside the grasshopper, where it will feed until ready to pupate. The grasshopper will not survive the activities of this parasite. Perhaps milkweed toxin is a remedy to tachinid fly infestation. The flowers are even attractive pre-bloom. Like many plants with multiple blooms, the flowers develop and open in succession, so the blooming and pollination activities occur over a long period. The underside of the Common Milkweed leaf reminds me of a thick carpet. You certainly wouldn’t imagine these tough, hairy, poisonous leaves to be something edible. I wonder what was after these plants that made them evolve such a collection of defensive mechanisms. If you want to attract butterflies and moths, the best strategy is to grow host plants, the plants on which the larvae feed. The primary function of an adult Lepidoptera is to reproduce and the number one attractant is a place to successfully lay eggs. 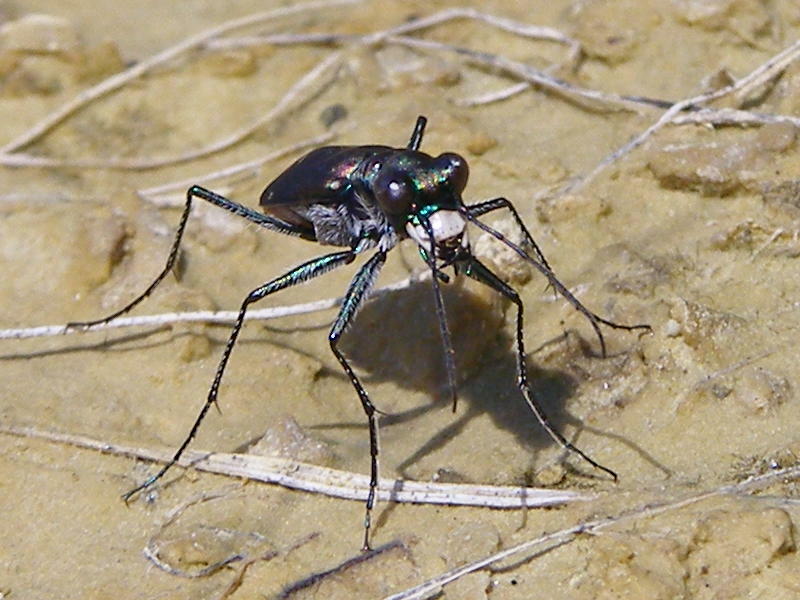 When nectar sources are absent from the host plant location, females will often starve to death laying eggs instead of moving off in search of food. Many moths, such as the giant silkworm moths, don’t even have mouth parts, so are incapable of eating. A garden full of chomping caterpillars is what you need if you want to see the greatest butterfly diversity. This voracious consumer of tomato plants has got to be familiar to anyone who has ever had a garden. This is the Tobacco Hornworm, Manduca sexta, the larva form of the Carolina Sphinx moth, one of the Hawk Moths. The Tobacco Hornworm is identified by its parallel white stripes and red colored horn. The very similar Tomato Hornworm has a white “V” pattern on its flanks and carries a black horn. There’s not much in the way of eyes here. In fact, there was no reaction at all to nearby movement or passing shadows. The larva can’t let anything slow its pursuit of nourishment. Like most herbivores, it’s not terribly effective at digesting and extracting nutrients from plant material. As a result, it has to pass a lot of plant material through its body in order to accumulate the energy necessary to complete metamorphosis. Look at those choppers. The Tobacco Hornworm is so often seen on cultivated plants that many people have forgotten that it is a native species that was here long before we began supplying it with an easily accessible buffet. Members of the plant family Solonaceae are the primary host plants for this moth. Virginia Ground Cherry, an Ohio rarity, fits this category, but is such a small plant that it would take a small patch to grow one larva. Could this be one of the reasons for the rarity of this plant? 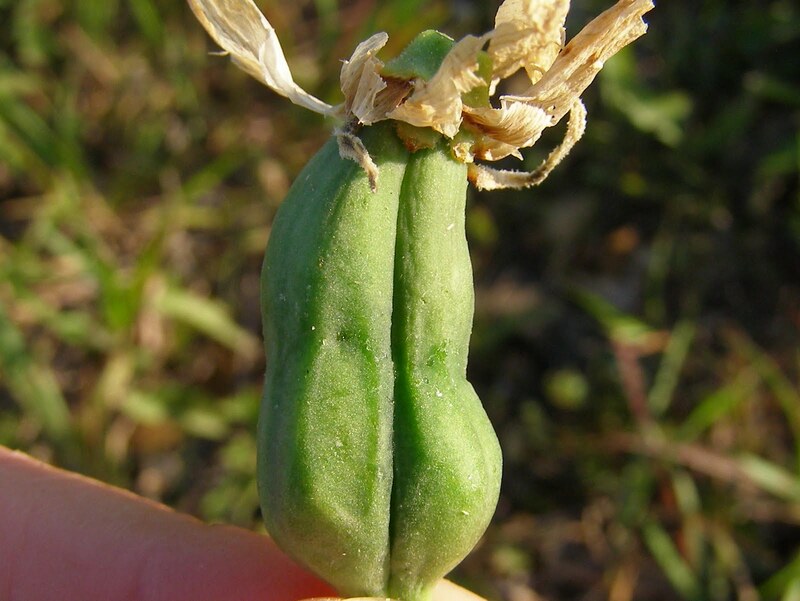 One hornworm could consume the above ground portion of every Virginia Ground Cherry at Blue Jay Barrens. This would certainly mean trouble for the plant. Judging by the amount eaten, this pepper plant in my garden is quite edible. Leaves, stems and fruits are all consumed. My guess is that the larva couldn’t consume the fruit as easily as the leaves, so it couldn’t take in enough to keep the body growing. With nothing left but a gnawed pepper fruit, the larva left this plant in search of another. Moving is a risky business since there’s a chance that no new host plant will be found. Fortunately, I planted a whole block of peppers, so the larva quickly found a new plant to devour. 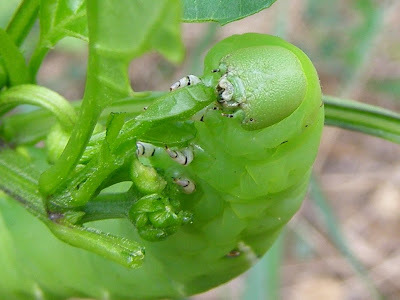 My wife loves peppers, so if she voices her displeasure at my letting the Hornworm eat two of our pepper plants, it will be evidence that she does look at this blog. I said earlier that I would be through with the flags by June 1, so why haven’t I pulled all the flags and put them away? 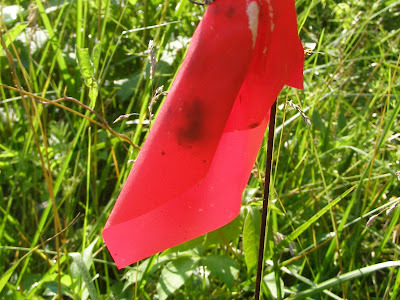 I did complete my spraying activities on schedule, but as I was pulling the flags, I found that some were being used as a home. The dark mass showing inside this rolled flag is one of the creatures that thought red was a super color for a house. Here’s that dark shadow, now out in the open. 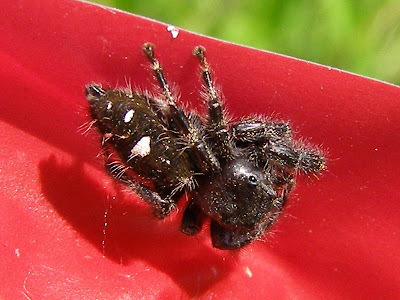 This is a female Phidippus audax, a type of jumping spider. 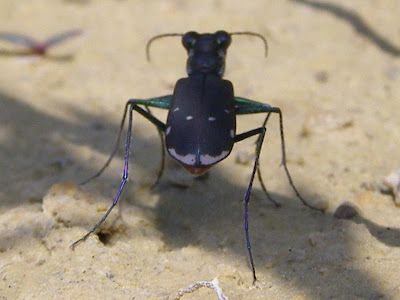 When seen at a distance, they are a velvety black with white spots. This is a very common spider that I seem to see everywhere. When I was younger, I used to keep them as pets. They would associate the opening of their cage with the appearance of food and would come out of hiding and stand ready to receive supper. This is what she was doing inside the rolled flag. 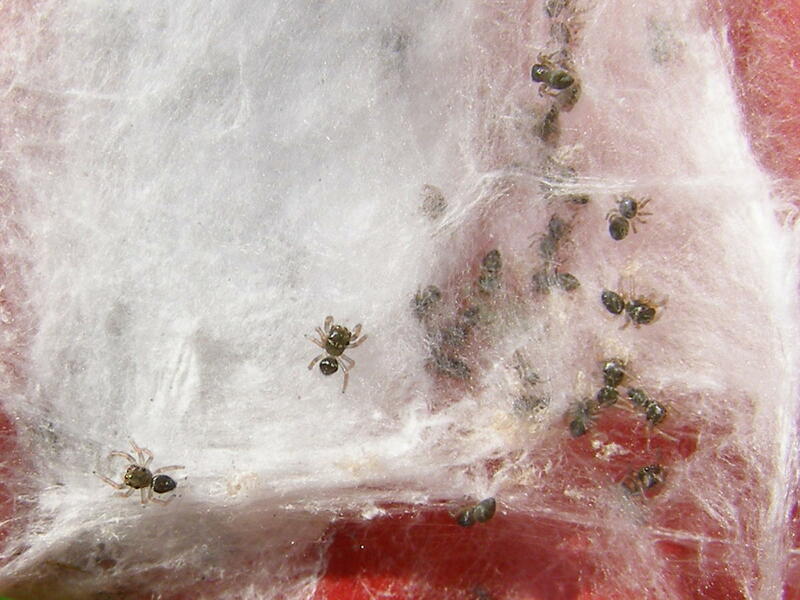 The flag must make good protection for the silken egg case. Plenty of babies were hatched here. 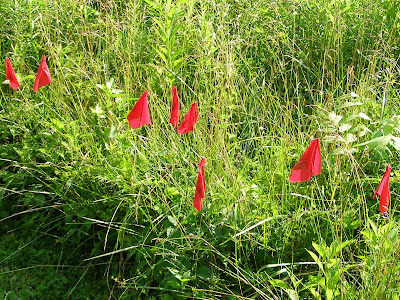 As I collected the flags, I kept the spider flags separated from the others and stuck them in the ground at the edge of the field near the house. 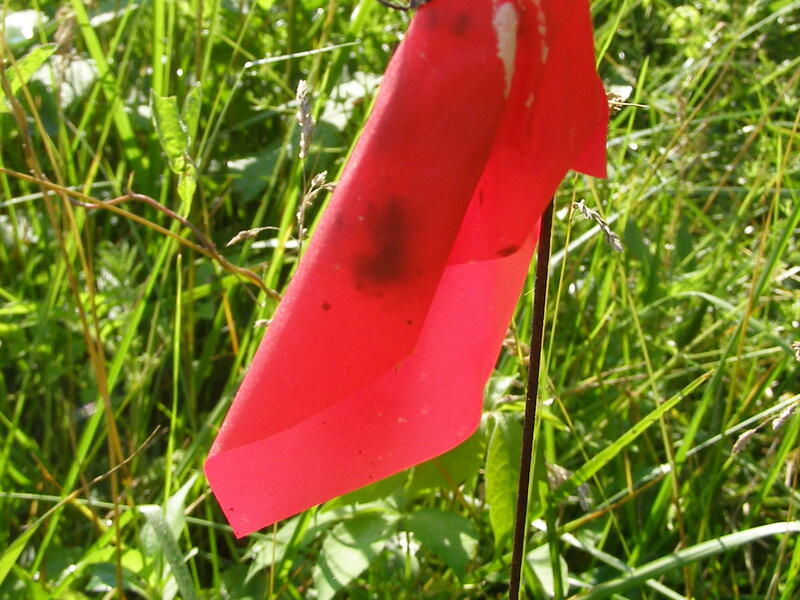 I had a total of about 40 spider flags, so the edge of the yard is going to have a spider population explosion. Most of the females and young have left. The females often hunted on the flags or dropped on a thread the hunt in the vegetation below. They have amazing eyesight and would scurry back into their flag nests as soon as I approached. I suppose you think I’m going to do something cute like put “The End” here. You would be wrong to think that, even though I did just put “The End”. There I did it again. What I intended to show is the pattern on the top of the abdomen. 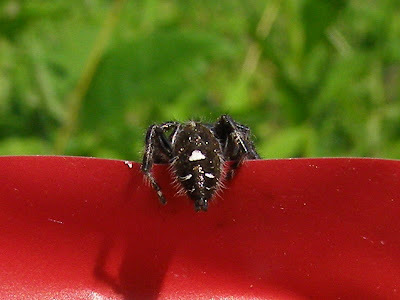 The spider ID books normally make some type of reference to this pattern, so it pays to make note of it. I actually got a lot of shots like this. The spider kept running from me and I had a tough time getting it to stay still long enough to get a full body shot. 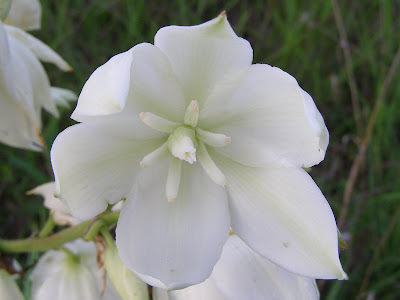 Yucca filamentosa is the flower for people who like white blossoms. This thick bodied bloom looks as if it were sculpted in a confectioners kitchen. This is a six parted flower, as evidenced by the number of petals and stamens. 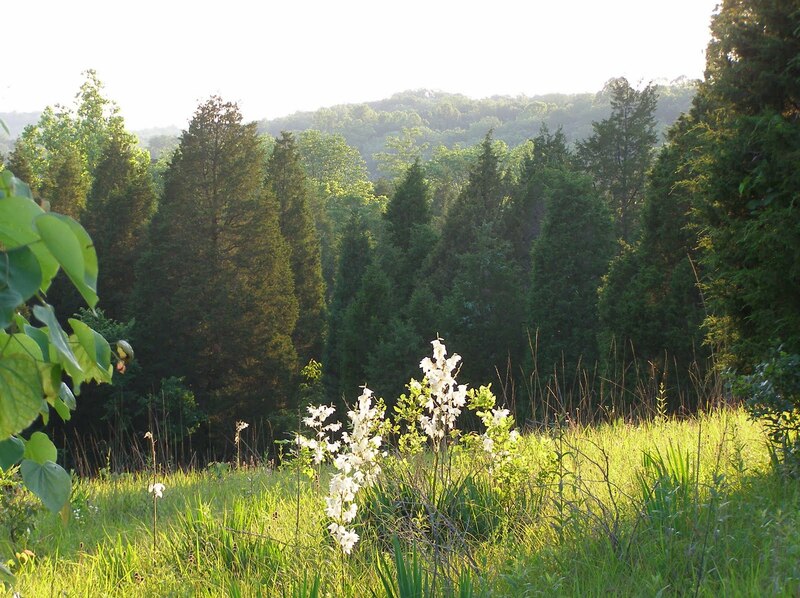 Yucca is a plant native to the south-east United States, so Blue Jay Barrens is not within his natural range. 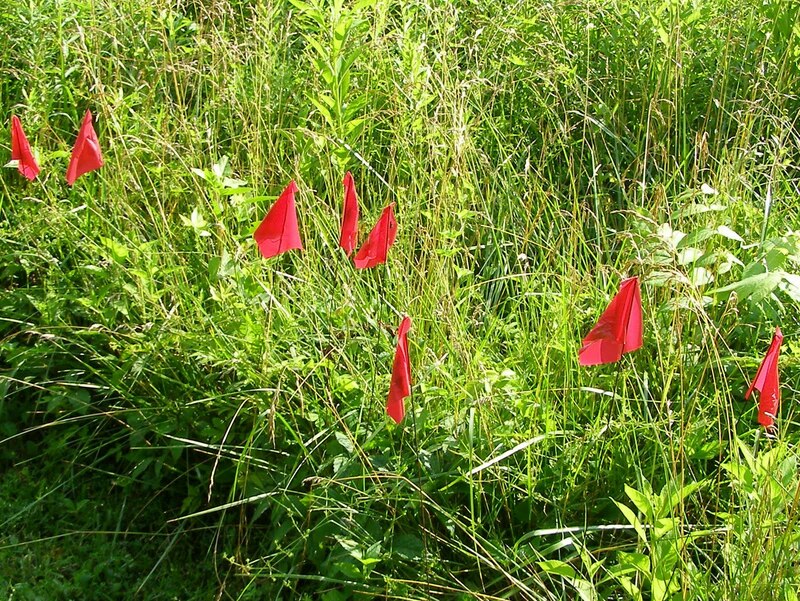 In one context it would be considered a non-native invasive species, because it will spread and take over an area. However, there are other more tolerable categories into which this plant might fit. One of those is the idea of Heritage Species. These are plants that have played an important role in the lives of our ancestors and because of that, have earned a special place in the landscape. 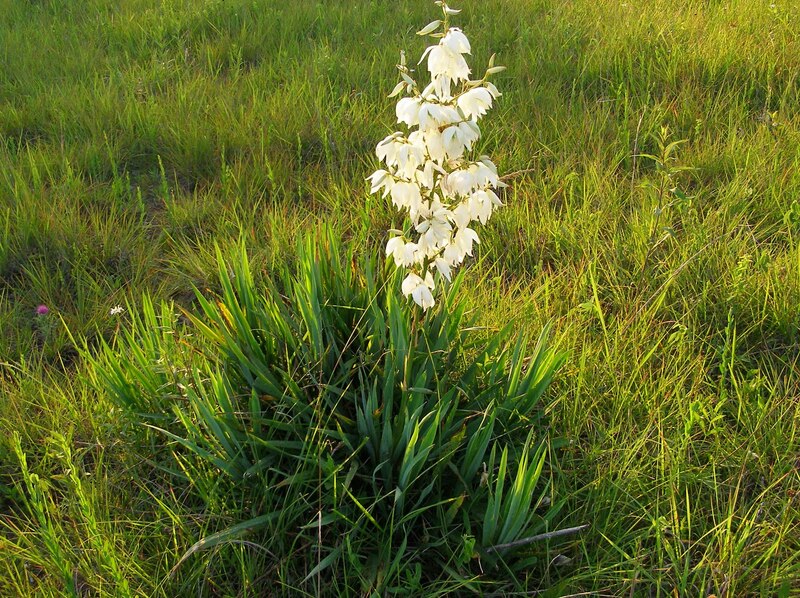 Yucca grows in dry sandy or rocky soils. 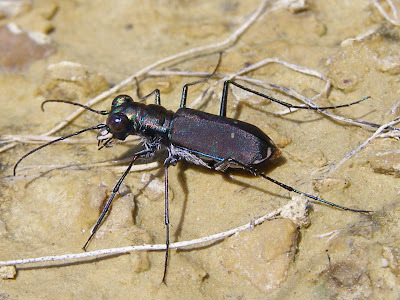 The fact that the natural range of this species is not terribly far from southern Ohio suggests that it could easily have become one of our native species without out help. Some sources cite historical accounts of settlers carrying the Yucca along with them to plant in their new homesteads. Other sources talk about Native Americans growing Yucca near their settlements and moving it with them as they migrated. The Yucca at Blue Jay Barrens grows on top of the cleared hill. As far as I can discover, no one knows of any cabin or dwelling being located anywhere on the hill. Serpent Mound is only a mile west of here, so maybe this was the historical local Yucca patch. I’ve been controlling the spread of the Yucca, but because of the possible historical significance of its presence here, it’s not slated for elimination. 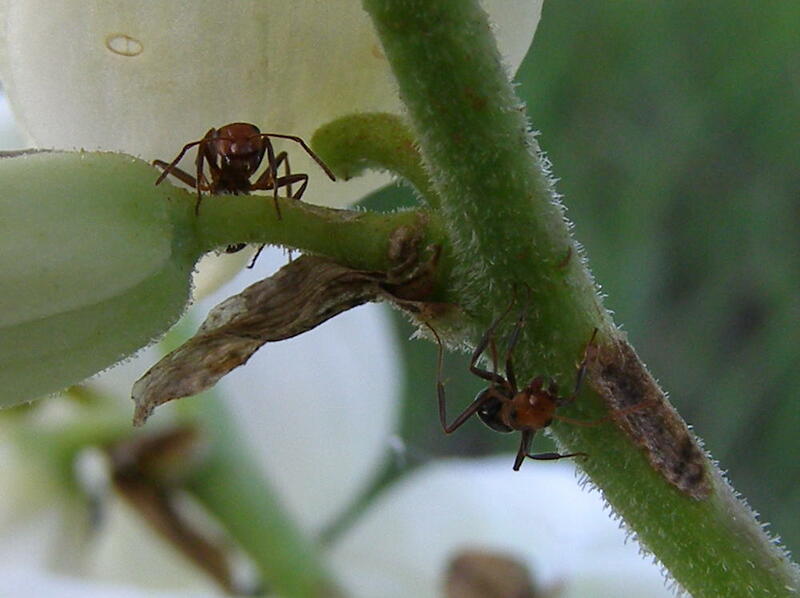 The Yucca may not be native, but there’s something on the plant that attracts the Mound Builder Ants. While these guys were reacting to the proximity of the camera, several of their colony mates were gnawing on my ankles. 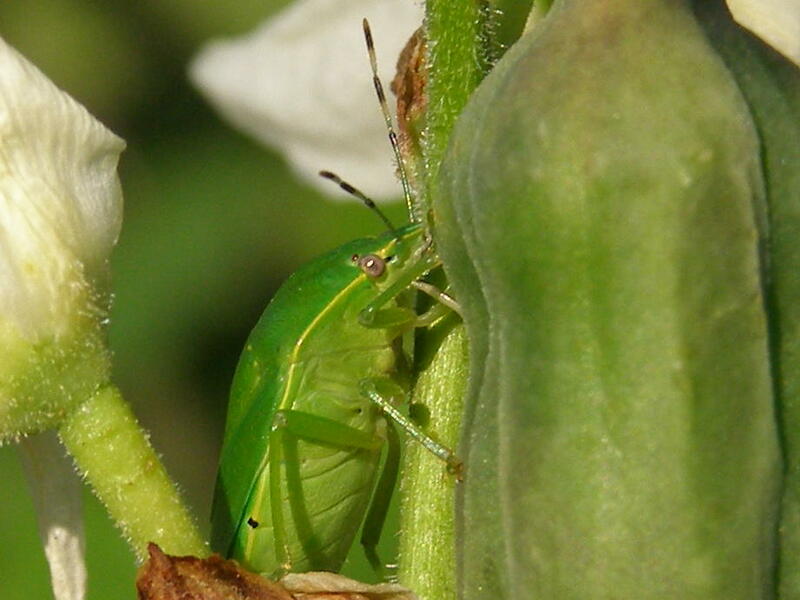 I found this stink bug probing around on the back side of a Yucca seed pod. It was trying to avoid me by scooting around the pod, but it ran into the flower stalk. There is only one insect that can successfully pollinate the Yucca flower. The female Yucca moth makes a hole in the flower’s ovary into which she deposits her eggs. She then fills the hole with pollen, which results in fertilization and seed development. The developing moth larvae then feed on Yucca seeds. The plant needs the moth and the moth needs the plant, a condition known as mutualism. 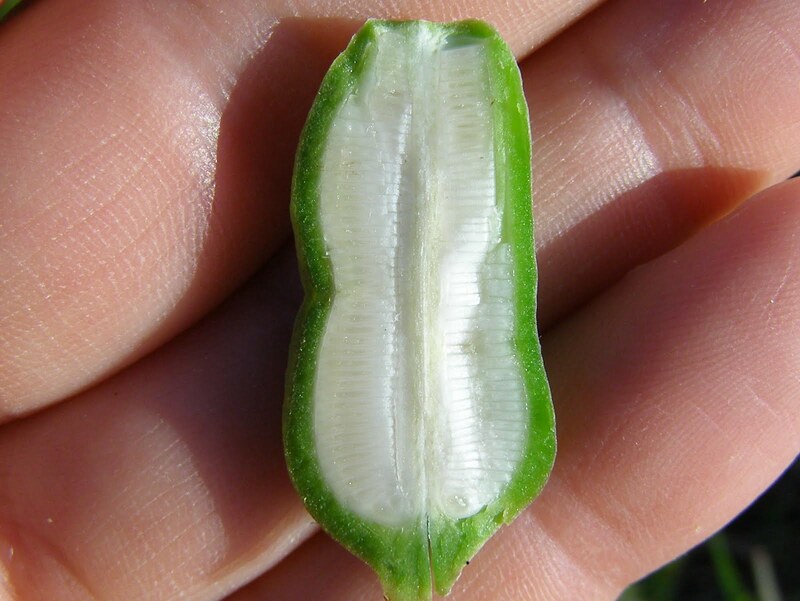 Inside a growing seed pod are rows of developing seeds. I’ve never seen a Yucca moth or the larvae or any holes in the seed pods or seeds that look as though they had been nibbled. If moths are the sole pollinator, they must be present, because the plants produce seed every year and spread to new areas through the distribution of fertile seeds. Why is it that after several years of searching, I’ve never been able to find any evidence of this moth? Is there actually some other pollination mechanism at work here? When I was growing up, I lived in many urban settings. In my mind, ferns and fungi were prime symbols of wildness and I always took the time to examine any specimens I came across. So what could be better than a place where both ferns and fungi thrive? Yesterday we saw the ferns, so today we’re going to dive beneath the fronds and look for fungi. Once our eyes adjust to the gloom, we find that our first specimen is a Bolete type fungi called Old Man of the Woods. 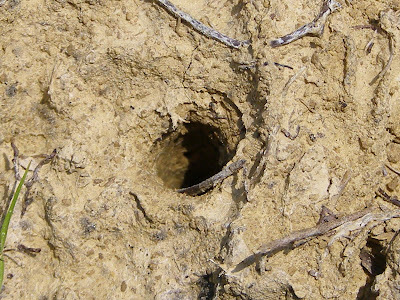 The spore producing portion of the Boletes is a spongy mass that is surfaced with holes or depressions. When dealing with fungi identification, it always pays to look beneath the cap. This is an edible species, although it never looks very appealing. As it ages, it can turn really nasty. I rarely collect any fungi to eat. Usually I find so few they wouldn’t even make a good snack. I prefer to leave them alone and keep watch on their progress through the year. The part of the fungus that we see is strictly the reproductive portion. Hidden within the soil or a decomposing log, the fungus mycelia play an important role in the soil ecology. Fungi are decomposers that break down organic material into less complex forms that can be used by other organisms. The mycelium plays an essential role in binding soil particles and distributing water and nutrients through the soil. 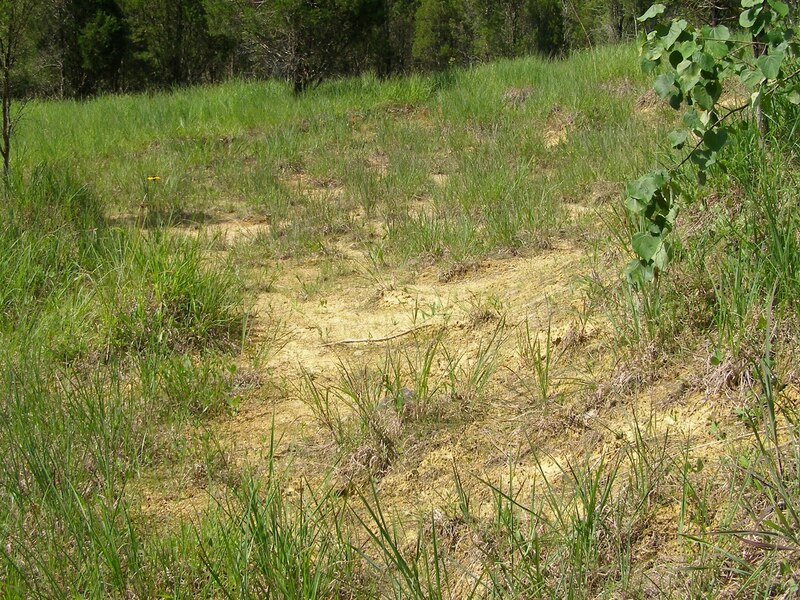 Many soil ecosystems would collapse if fungi were removed from the mix. This is the part that produces the spores. Millions of spores will develop in those gill structures. When ripe, the spores take to the air and are capable of traveling half way around the globe. In spite of their ability to spread spores over many continents, fungi typically require fairly specific habitats in which to grow. Some fungi develop brilliant colors. This is a Fading Scarlet Waxy Cap, also an edible species. You would think that something that was edible wouldn’t advertise its presence like this. Maybe it’s a case of being protected by resembling an unappealing species. When the summer temperatures climb into the nineties, it’s nice to retreat into a cool, shaded hollow. Blue Jay Barrens has several places that, due to a combination of topography and vegetation, are much cooler than the surrounding area. These areas also provide ideal growing conditions for Christmas Ferns, Polystichum acrostichoides, one of my favorites. In this spot, there’s even a misshapen tree that forms a natural recliner for those times when you just want to lean back and relax. Christmas Ferns take on several forms during the year. During the late spring it acts like an upright fern with shiny light green leaves. When autumn approaches, the leaves will be a much darker green and will begin to sprawl close to the ground. Leaves will stay green all winter and will not begin to die until the next year’s growth is underway. The stocking shaped leaflets of the Christmas Fern are quite distinctive. Some leaves grow longer and narrower and beneath the leaflets are rough brown patches. These are the fruiting bodies that produce spores. The light weight spores float on the wind and blanket the countryside. Only a few of the millions of spores will alight in a location suitable for development and growth into a new plant. The pattern of these fruiting bodies is often a key characteristic in the identification of ferns, so when looking at ferns, it’s always a good idea to flip a few leaves and look beneath. While searching for a good area to photograph leaflets, I noticed a bird dropping that look suspiciously like something alive. I thought it might be a larva that mimicked bird droppings. I decided to use that little stick to the right and poke the larva to see what kind of reaction I would get. It turns out that I was completely fooled here. The stick turned out to be an inch worm type larva that just looked like a stick. The thing I thought was a larva was actually a bird dropping. The dropping wasn’t typical, though. It looks like part of an earthworm that may have been the intended meal for a nestling. It just shows that the closer you look, the more you’re going to see. There are a lot of butterflies out right now, but I’ve noticed that many people focus on the large butterflies and overlook the smaller specimens. Some of the gems of the butterfly world look at a distance to be just dime sized blobs of gray. One of my favorite groups is the hairstreaks. A slow approach will get you in close to these guys and you must be close to get the full effect of their magnificence. 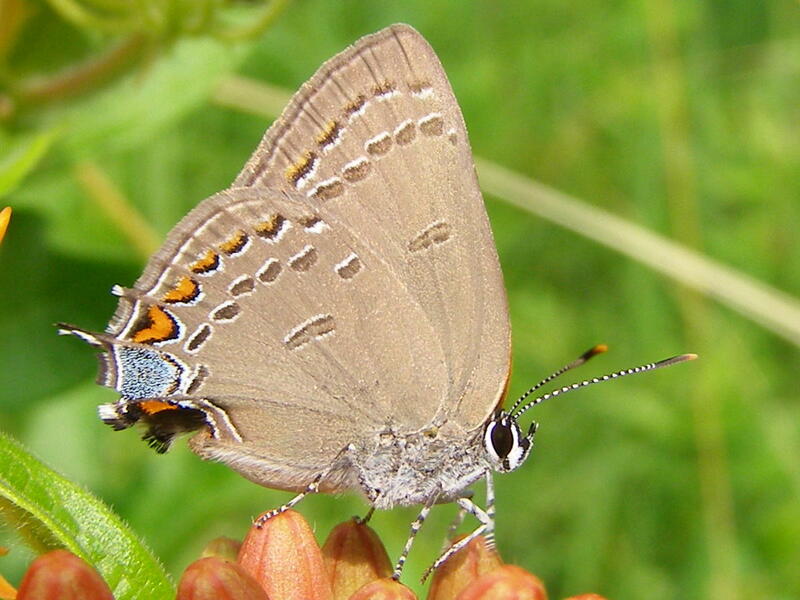 This is a Coral Hairstreak, currently the most abundant hairstreak in the air at Blue Jay Barrens. This specimen is sitting on the unopened blooms of a Butterfly Milkweed, Asclepia tuberosa. Butterfly Milkweed is a prime spot to watch for this and many other species of butterflies. Although they are usually easy to get close to, a startled individual will shoot away like it was jet powered. 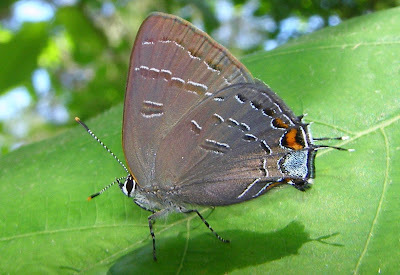 Edwards’ Hairstreaks are especially abundant this year. Hairstreaks all share the same general facial pattern. Fortunately, the wing patterns allow the different species to be easily sorted out. This is the Banded Hairstreak. I usually find this butterfly by unintentionally scaring it out of the grass in the prairie openings. Its dark gray color and rapid flight make it look like a piece of shale that’s been flipped into the air. They almost always come to rest on an oak, one of their host plants, in and around the prairie openings. The tiny Eastern Tailed Blue is often mistaken for a hairstreak. 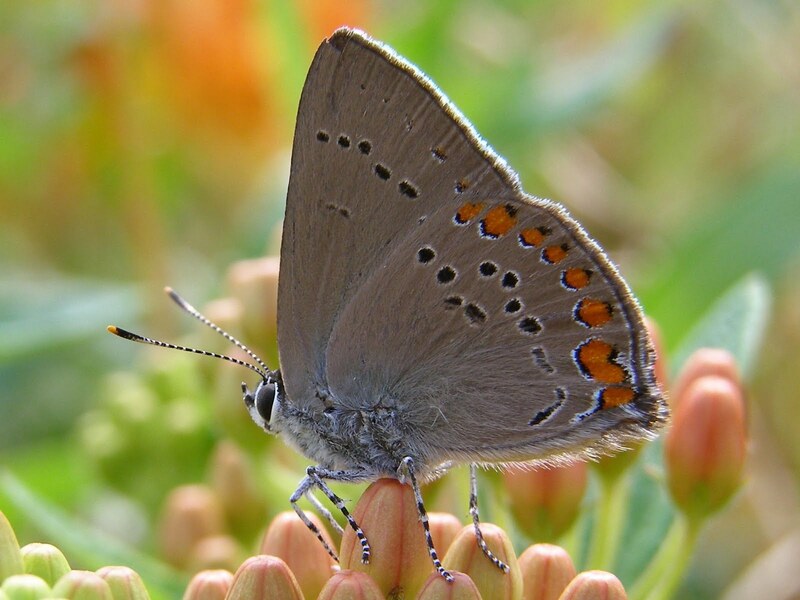 This butterfly is so common that anyone who has ever gone outside during the summer has probably seen one. From the upper side, you’d think it was an entirely different species. It’s really hard to see from a distance, but close up, the white edging really makes it stand out. 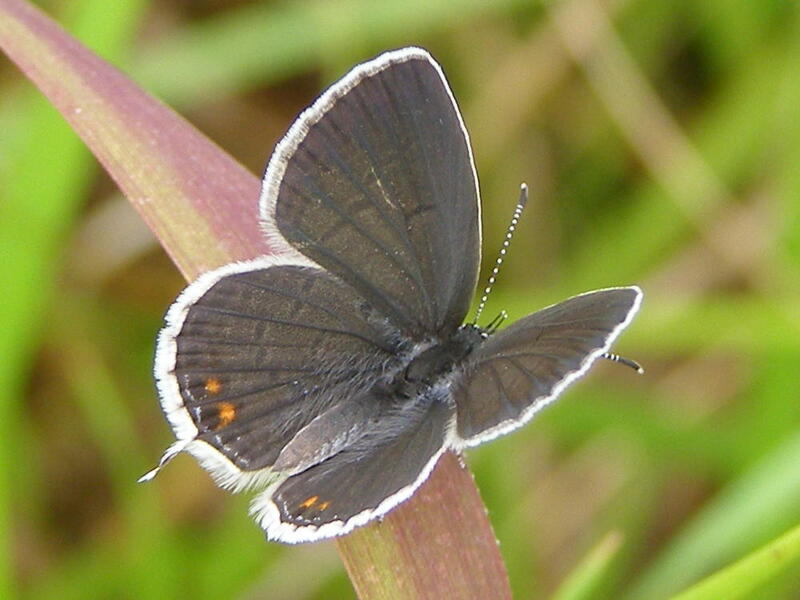 Well, not only have I strayed from the topic of hairstreaks, I’ve jumped from butterflies to skippers. 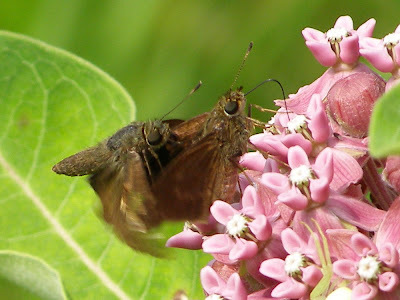 I just had to throw in this picture of the persistent male and the female that just concentrated on sipping milkweed nectar. She eventually drank her fill and the couple buzzed off together. 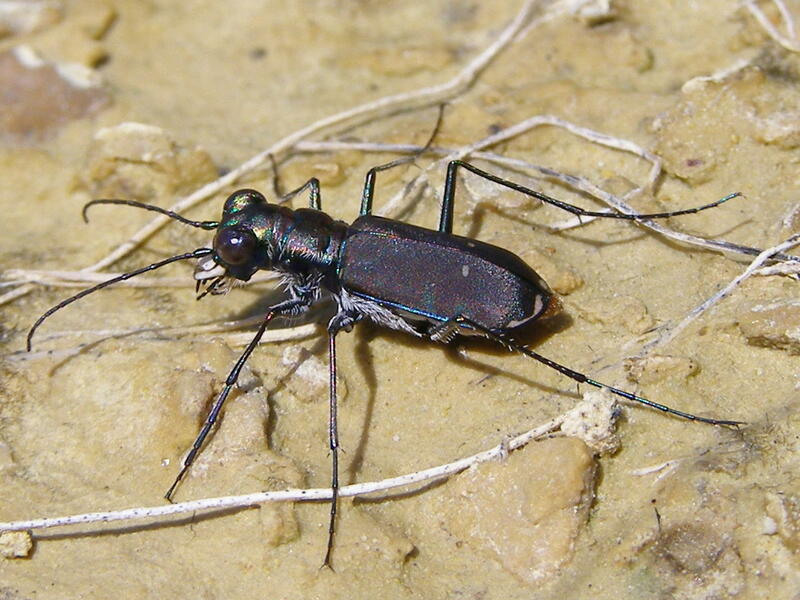 The increased flow in the creek has resulted in an abundance of stream dependent creatures. 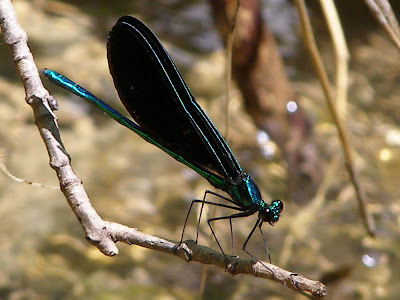 This is a male Ebony Jewelwing damselfly, sometimes called the Black Winged Damsel. 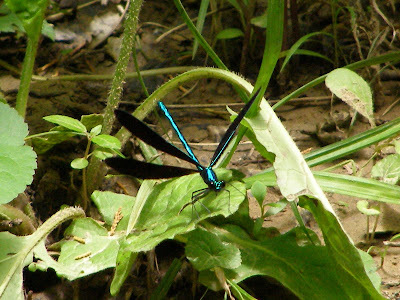 A male will watch over a section of stream that he defends as his territory. Females lay their eggs in the stream and are attracted to the best quality riffles, so males compete fiercely for control of these areas. 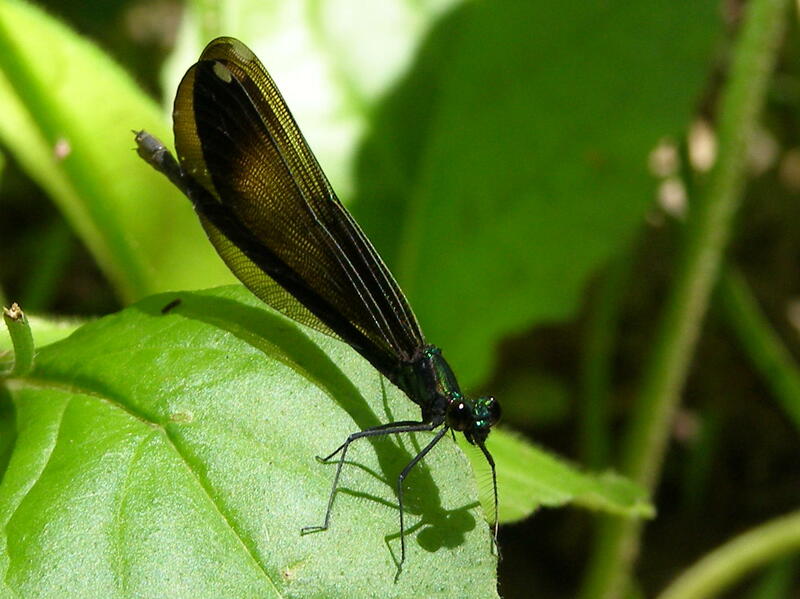 Female Ebony Jewelwings have lighter colored wings and less intense body coloration. 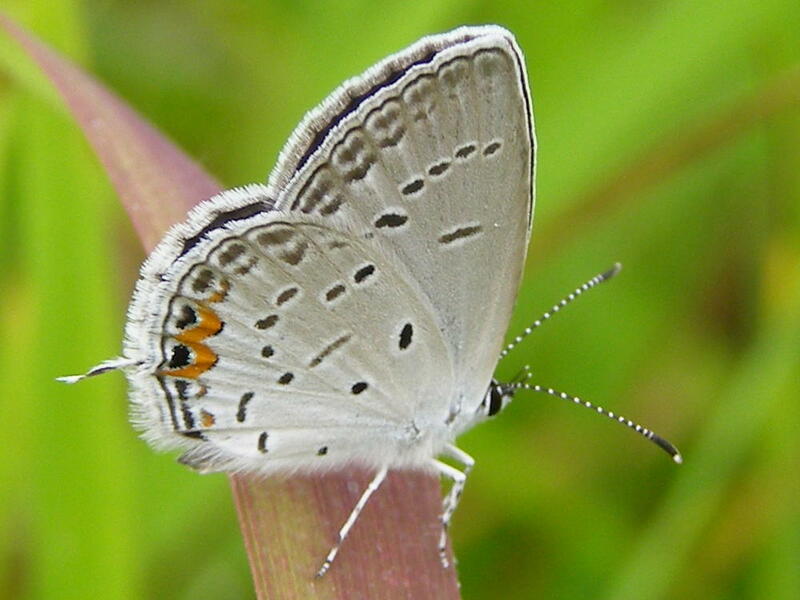 There are also white spots near the tips of the wings. Since the males are so aggressive toward other males of the same species, there probably needs to be a noticeable difference between the sexes to help facilitate successful pairings. These common damselflies are never far from streams and are most often encountered flying over the water or perched on vegetation near the stream bank. 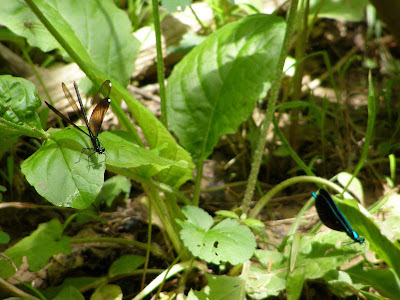 This male, shown bottom right, has attracted a female, middle left, into his territory. After mating, the male will guard the female from the advances of other males as she lays her eggs. The male uses a special wing display to attract females. The wings are slowly spread apart and then abruptly closed. An interested female will respond with a like signal. 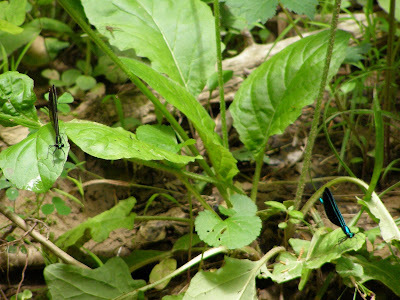 This particular courtship was interrupted when the male flew off to chase away another male. While the two were chasing each other around, the female took off and headed downstream.